*Data taken from official Alpha Sigma Lambda website on 3/11/2013. Compare Alpha Sigma Lambda Graduation Cords in Deep Burgundy and Antique Gold (the official colors of ASL) to honor cords available from Honors Graduation! 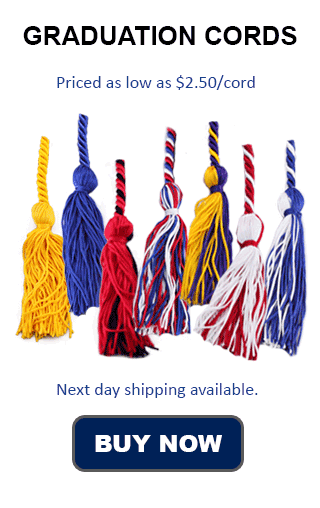 Honors Graduation burgundy cords and antique gold honor cords are available on our cord order page. This cord is a double cord and features both the colors burgundy and old gold in separate cords, tied together. Our burgundy and gold double cords are only $12.00, and are of the highest quality. At Honors Graduation there is no minimum order size. We have a flat rate shipping feature that is one low price for shipping no matter how large or small your order. In addition to these great services, we also have bulk pricing for our burgundy and antique gold graduation cords starting at just 5 cords. Many Greek letter organizations offer their students the option to wear greek honor cords at graduation in recognition of particular achievements. Students who may be older than the traditional College or University Student can be recognized by participating in honor societies that help them meet other students of similar backgrounds, interests, or skillsets. Honor Societies for non-traditional students are just one way that students can participate in campus activities.